The father of one of the victims of the 2004 Ishrat Jahan "fake" encounter, on Tuesday said his son had come to Gujarat to meet a top police officer, disputing claims that he was on a terror mission. "My son had come to Gujarat to meet a top state police official," Gopinath Pillai, father of Javed Sheikh alias Pranesh Pillai, told mediapersons in Ahemdabad. 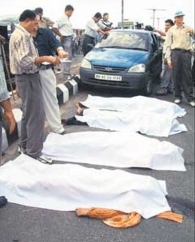 Javed and Ishrat, along with two others, Amjad Ali Rana and Zeeshan Johar, were gunned down by the Gujarat police on June 15, 2004 on the charge that they were on a mission to eliminate Chief Minister Narendra Modi. The Central Bureau of Investigation has claimed all the four were killed in a "fake" encounter. Asked about purpose of the meeting, Gopinath said, “My son told me that he (the police officer) was a very good friend of his and he would help us establish our business." Gopinath, who hails from Kerala while his son stayed in Pune, didn't say anything about the officer's identity. Asked if his son had worked as an "informer" for police, Gopinath replied in the negative but maintained Javed shared a "good relation" with police. He said he was upset with recent reports that the CBI officers investigating the encounter were being threatened. Gopinath said Javed had paid the college fees of Ishrat, a Mumbai-based teenager, one week before they were gunned down. Meanwhile, Mukul Sinha, lawyer of Gopinath, said the killings were part of a conspiracy and claimed Javed had no links with terror activities. "We have filed a contempt of court case against senior Bharatiya Janata Party leader Arun Jaitley for questioning the investigation into the encounter case," Sinha said. Sinha said the list of witnesses submitted by the CBI along with the charge- sheet indicates that senior Gujarat police officer Mohan Jha had pressured witnesses into retracting their statements. "If this is found to be true, we will go to court against him," the senior lawyer added. Was Ishrat encounter a result of police overzealousness?